I truly believe that every one of us (yes, that includes YOU!) has cool tools that we use on an everyday basis and stories about how we use these tools and how we came to find and use them. I'd like to hear about yours. This week’s Cool Tool, the new Pulse digital pen from LiveScribe, is still undergoing my evaluation since I’ve only had it about a month now, but it has already lived up to its predecessor, the now discontinued io2 digital pen from Logitech, which I nominated as a previous Cool Tool. I can see that this new Pulse pen has much more to offer, so I thought it worthy of bringing to your attention. These features intrigue me and seem to have so much potential that I’m going to address them in a separate posting. I got this new digital pen (thanks Kelly!) 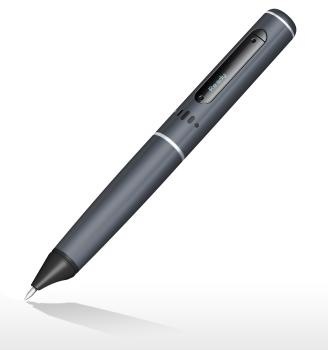 in part to replace, as I already mentioned, my beloved and previous Cool Tool, the io2 digital pen from Logitech. For reasons that still elude me and which Logitech seems to deny and not want to discuss, the io2 has been discontinued. Logitech is not providing new drivers for the io2 so that it can work on Vista, so I’ve been having to use an old XP machine to keep my notes. Plus, the digital paper is no longer available and my supply is almost out. I continue to champion and use digital pens and paper because I still find that writing and sketching on paper is the best option in many situations and ensures that I always have a digital version for better sharing of my notes and sketches and for the assurance of a backup copy and long term storage. The new Pulse pen from Livescribe has proven to provide all these features so it makes for a good replacement, but what makes it worthy of an additional Cool Tools posting is that it adds some additional new capabilities which have truly surprised and excited me with their potential as I’ll explain shortly. You can also check out the interactive demo and overview on the Livescribe site, which has links to other articles and reviews by PC Magazine, USA Today, etc. Not surprisingly (read on), the Pulse pen is based on Anoto digital paper technology, which utilizes an almost invisible micro grid of small unique digital dots covering each piece of digital paper that is then recognized by the infrared camera in the end of the pen. The list of items that come with or are inside the pen itself include: a rechargeable battery, internal microphone and speaker, USB port, an LED screen (currently quite underused I think), and a set of ear buds and microphone. The included PC desktop software (Windows only at this time, Mac version said to be in development) copies all your written and audio content whenever you plug the pen into the USB cradle to recharge and synchronize with all your previous notes and recordings. Since this content is now stored as files, you can view, share, and edit them further. From within the Livescribe desktop, you have the option to upload your files (text only, audio only or both) to your own online space for either your own access or for sharing this with whomever you choose to grant access. The digital paper comes in a variety of formats, including a very nice leather bound “Moleskin”-like version which I like the most so far. 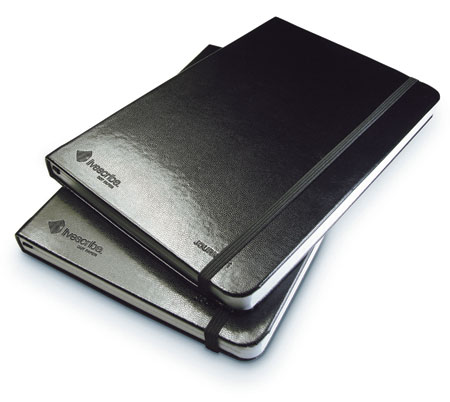 Each notebook also contains a set of additional capabilities, which are printed inside the covers or at the bottom of each page. These include an impressive calculator with full trig, financial, and scientific functions, as well as audio controls, book marking and a full keyboard. The pen itself comes in 2 versions with either 1MB or 2MB of internal storage. Each MB is capable of holding about 100 hours of audio (at the lowest setting), as well as all your written notes and any additional programs you choose to install. I have the 2MB version and after taking both audio and "written" notes regularly and frequently for more than a month, it still has over 1MB available. You can delete what is in the pen’s internal memory every time you put the pen in its USB cradle and synchronize it with your PC. Almost as interesting as the pen is the man behind it all, Jim Marggraff. Until last year, Jim was the CEO of Anoto, the Swedish company that developed the technology used by the vast majority of digital pens (I think), including of course this latest Pulse pen from LiveScribe. At 48, Marggraff has already achieved tech world fame and fortune as the inventor of the LeapPad and the FLY Pentop. I can highly recommend the Wired article from back in November 2005 called “LeapFrog’s Wild Ride” that will tell you the interesting story about Marggraff’s journey from being the CEO of Anoto to building the fastest growing toy company in history, Leapfrog and the Fly Pen. The Fly Pen grows up? I was an early customer of the Fly Pen back in 2005 and in many ways, I see the new Pulse pen as a “grown up” version of the Fly Pen that was aimed more at children and students, though I should note that there is now a newer version of the Fly Pen that is called the “Fusion”, which has a lot of improvements over the original. I was very disappointed when the Fly Pen was not a breakout success, since I thought it had so much potential. I bought several of these for friends to play with and gave them to several who had young children. But for a variety of reasons, it just didn’t catch on with either adults or kids. After experimenting with it and also after talking with others, my take was that the Fly Pen and its interface was just a bit too complex and non-intuitive. Most people who tried it never got past that critical first few minutes and figured out how to use it and unleash its power. But for me the potential is still HUGE and these are just part of the steps along the way to eventual success, as is usually the case with truly revolutionary technologies and inventions. Hence my delight when I found that the Fly Pen had in many ways evolved into this new Pulse pen. Of all the many things that are capturing my curiosity with this new Pulse pen, I must say that the connection between writing and audio is at the top of the list. 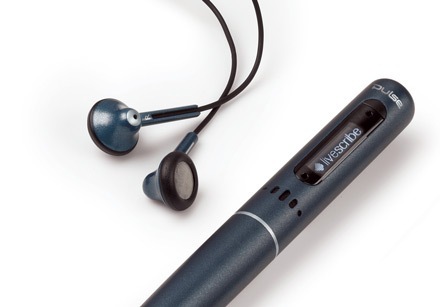 With the Pulse pen, you have the option to easily record audio (just turn on record with a tap of the pen) with the built-in microphone and then listen either through the surprisingly good built-in speaker or plugging in the supplied ear buds and microphone. This latter accessory is full stereo BTW and provides what Livescribe hyperbolically describes as “3D sound”. But for me the real power lies in the combination of controls for finding and playing the audio, and the ability to create mashups of written notes and accompanying audio. This has already had a significant effect on the way I take notes. Because I now know that the full audio of the conversation I’m having with someone in a meeting is being recorded, I can and do take much more condensed notes, simply jotting down the key words, phrases, or just marking a key point in the conversation. What I can do afterwards is touch the pen to any word or mark in my paper notes and start hearing the audio that was present at that time. It's very cool and useful. Taking notes in meetings, lectures, and presentations is a great application of this Cool Tool. I’m also finding myself writing my own notes differently. I now often turn on the record feature as I’m jotting down some of my thoughts and ideas and then talk while I’m writing to provide more details in my notes, reducing the amount of writing I need to do. These added audio capabilities have also enabled me to be much more productive when my hands are otherwise busy, such as when I’m driving. In these cases I use the “pen” as more of a digital audio recorder. In this situation, I just use the pen and paper to help with later access by making a few marks or one word notes for reference. The recording function also lets me capture external sounds that are going on around me that are related to what I’m writing about and want to share, such as music, birds singing, street noises, etc. Perhaps even more valuable is its ability to create voice-annotated interactive sketches and drawings. You can talk while you are drawing to explain details, symbols, and background. It gives you the ability to synchronize locations on the drawing with the audio so you can create a drawing whereby you can tap on a spot and hear the audio explanation that goes with it. Simple yet powerful. For example I recently had the opportunity to tour the Mayan ruins of Copán in Honduras. I was able to record the guide talking while I took some written notes and made some sketches of the layout of the ancient Mayan city. I could also go back and add my own audio explanation to my sketches from additional details I had learned from reading plaques and from spending a few hours in the museum. The result is a series of annotated sketches I can share with others or refer back to and help out with those “senior moments” when I can’t remember details from this fascinating tour of the Mayan ruins. On my wish list for future releases is the ability to manipulate and edit the tech and audio portions independently. For instance, it would be much better if I could take a piece of audio, such as a recording of the guide in the Copán ruins, and trigger it to play when I tap a spot on a sketch I create later. This would be much like the way we can currently move and manipulate text and photos in blog entries and documents. I’ve got the 2MB version, which gives me the ability to capture up to 200 hours of audio. This capability encourages me to turn on the audio recording feature and add audio to almost all my notes, a response that is similar to the “if in doubt shoot” approach many have adopted since the advent of digital cameras where there is little or no cost to taking more pictures, and you might just get that perfect shot! On the down side, I guess this also leads to a society full of people who appear to be “talking to themselves” with the advent of hands-free mobile phones with wireless Bluetooth head sets, Skype calls, audio interfaces, and now digital audio note taking. So PLEASE practice and encourage considerate audio etiquette whenever you are “talking to your technology”! Microphones are typically very sensitive and do NOT require yelling to be understood! LiveScribe enables you to share your work as an attachment to an e-mail, a posting on Facebook, or for downloading as a PDF. The company is also hosting what they call “Pencasts” that let you put your written plus audio notes up on the web. This could be quite a useful feature for capturing, sharing and reusing lecture notes (and the lecture itself!) or presentations and meetings. I expect this will lead to some interesting additions to blogs, web sites, and social sites such as Facebook and MySpace. Here for example is a Calculus 191 lecture on the Livescribe site. While the recording is not the best quality (note: you can change the setting of audio recording quality), I rather like that it takes only the push of one button on the pen to turn it on and one tap of the pen to instantly start recording everything you write and any audio happening at the same time. What matters is that it works and is simple and easy for anyone to do. In my estimation, the highest potential for the future of the Pulse pen is the ability to create additional programs and applications which utilize the pen’s capabilities. One tantalizing example is a demo of a translator function where you can write in one language and have it be translated and “spoken'” via the speakers in another language! A demo included with the pen has the ability to translate from English to Spanish, Mandarin, Arabic or Swedish for a limited set of 20 words, such as hello, goodbye, coffee, chocolate, beer, and numbers from 1 to 10. It has been great fun to try out even this very limited set of words with some of the people who only speak Spanish here in El Salvador. Just start to imagine the potential this has when there is a much larger vocabulary and selection of languages! For example, you could be in a taxi giving directions and write down what you want to say and then have the pen “speak to” the driver. Or you could hand the pen and paper to someone and have their writing translated for you, so you can communicate with them despite language differences. We’re still a ways from the “Bablefish” translator of Douglas Adam’s imagination but the feature of the Pulse pen definitely elevates it to the Cool Tool status in my view. I’m fascinated by this overall capability for combining writing, drawing and programming. The Pulse pen lets you create your own interfaces anywhere you want (on digital paper) by just drawing them. For example, you can draw a cross symbol, which the Pulse pen understands for navigation. You can then use this simple graphic interface to scroll through the programs on the pen, playback of the audio, etc. For example, a demo has you create a piano by drawing an eight note keyboard which you can then “play” by touching the pen on the virtual key on the paper and hearing whatever note you touch through the speaker in the pen or via headphones you can plug into the end of the pen. While these demos are just limited examples, the potential of being able to have hand drawings and symbols create interfaces and trigger actions offers truly unlimited potential and power in my mind. I should note that these abilities for hand drawn interfaces and even the piano and translation demos were in the original Fly Pen and they generated most of my initial excitement. I’m therefore hoping that both Livescribe and especially external individual developers will be bringing us a flood of additional software programs that we can add to our digital pens and paper to extend their functionality and use more. This is where the developer’s kit and API are so critical for the future of this pen. On the Livescribe web site there is what appears to me to be a reasonably complete set of tools, including a “content development kit” (CDK) and a software developers kit (SDK), which allows for others to create add-on programs and games. Just as was the case with operating systems initially and now the web, this ability to extend the basic functionality and open it up for independent extensibility will be key to determining the future success of the Pulse pen and others to follow. Initially, just as is the case with games, this will be depend upon the degree to which independent developers take up the charge to create add-ons and applications that extend the capabilities and applications of this new technology. But over time, my greatest hope is that this capability to “draw your own" interface and programs will enable any of us, regardless of our programming skills, to create just what we need. The Pen Ever Mightier than the Sword? As I re-read what I’ve written above, it doesn’t sound like much to be able to capture handwritten notes, sketches and audio. But as with most major value propositions, I often find that the simplest things turn out to be the most valuable and powerful. While I think this new Pulse pen is but one example, this ability to both capture, find, control, and replay the mixture of text, images, and sound in a very simple and intuitive way—pen and paper—is extremely compelling and powerful. I hope some of these new capabilities of digital pen and paper ignite your imagination as much as it does mine and that you’ll look into these digital pens and paper. As I said previously, the success of this technology will depend in part on the degree to which we see the development of add-on applications and capabilities. However, it will ultimately depend upon the degree to which all of us see the potential of digital pen, paper, and audio and begin to adapt, adopt, and apply it to innovative and creative uses. What do you think about digital pens and paper? Are you using any yourself? Would it make it to your Cool Tools list? It usually takes months or years of regular use for something to make it to my Cool Tools list, but the Pulse pen is definitely already there. Free your imagination and I’m sure you can already start coming up with many other exciting ways to apply and extend these new capabilities of pen and paper, along with the mashups you can create by adding audio into the mix. I’ll be back with more wandering and pondering about digital pen and paper and especially the combination of audio, writing, and what I see as the evolution toward truly natural interfaces. Hope you’ll stay tuned! 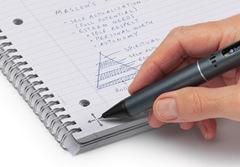 Do you know if you can use Livescribe's paper with the Fly Pen Fusion? i once saw a commercial of a boy who wrot down 5 math problems,numbered 1-5,and then wrote help inside a box,touched it with the pen,and then it audioed the answers right off! i don't remember the name or brand,but this was acouple of years ago,and can this pen do that? also,can i use regular papper with it? and what happens if i run out of ink? I own a pulse pen currently. I have had it for about two weeks. It def. lives up to the hype. You can not use regular paper with it. There are special tablets called livescribe notebooks as well as journals. They are priced the same as a regular five star mead notebooks. So you're not paying extra, if minimal. As the author points out, livescribe has updated the desktop application for the pulse pen to now print the special paper for free, so long as your printer has the capabilities. But, why print loose leaf paper when you buy a notebook at regular notebook price that it bound together? I use my pen as an MBA student as well as a professional therapist. It works great for both situations. Being a MBA finance student, I am not at all happy with the finance calculator due for reasons I will not get into. All in all, I would say that the pulse pen is great for serious high school students and up as well as the professional who needs to take a lot of notes. The memory comes in GB's not MB's. I wish I had this pen for the first year of Grad school. It is still useful for keeping up with the PI's rapid experimental rundown. I like annotating important audio points to skip the filler audio. I have tried the Mac version and it is great! The only thing missing is the print feature for creating a notebook. MacWorld news said a full Mac version will come out in mid Feb, hopefully this is included. I have a digital pen tevion. it draws at two different points at the same time. can some one tell me what the problem could be. yeah,where unexpected paths lead to great discoveries. There was no reason to lecture a room full of educated, middle class people about the importance of their involvement in their child's education. I thanked Cliff afterwards for being on the panel and representing the views of every single parent that I've spoken with. I would have to surprise at such great works of digital pen and paper.really very informative sharing. The new Pulse pen from Livescribe has proven to provide all these features so it makes for a good replacement, but what makes it worthy of an additional Cool Tools posting is that it adds some additional new capabilities which have truly surprised and excited me with their potential as I’ll explain shortly. This is where the developer’s kit and API are so critical for the future of this pen. That is one nice pen. I know there are a lot people that wants to have it. I am absolutely one of them. I attend a large number of conferences, workshops, training events, and tele-seminars every year and I am a voracious note taker. It would not be unusual for me to complete 30 pages of detailed notes at a day long conference or a complete notebook at a weekend event. I know allot of people who do not like taking written notes and prefer to use a micro-audio recorder to tape events and transcribe later, which is a very time consuming task. Well, I was introduced to a great new tool to satisfy the needs of individuals in both camps plus it is just plain cool! What Polak has concluded from his listening labors seems at once obvious and also profound: Most extremely poor people in the world don’t make enough money on their farms. They need to change the ways they farm, adopting such tactics as growing high- value, labor-intensive crops in the off season, which can be done with affordable irrigation technology, seeds and fertilizer. 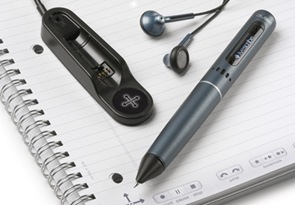 The Livescribe is a digital pen that writes normally while simultaneously digitizing what is being written and recording audio. What this pen allows me to do is to synchronize the taking of notes with the audio of the event. As I go through a brain storming session with a customer I can pay attention to the interaction at hand, draw on paper, record the audio, and then at a later time go back and review the notes in-sync with the audio. It also frees me up to take fewer notes at the time of the initial meeting. This allows me to concentrate on the meeting at hand and then go back and review the audio while filling in the blanks as needed or create a list of follow up questions. The Pulse smartpen is a computer in a pen that records everything you hear and write, and synchronizes the audio to what you write, so you never miss a word. I love it whenever people get together and share opinions. Great blog, continue the good work! Live Scribe Pulse Digital Pen and Paper very nice pen thanks for share .